According to information collected by Minghui.org, 310 Falun Gong practitioners were arrested and hundreds were harassed in August 2018 for their belief. At the time of writing, 98 of the arrested practitioners have been released; the rest remain in custody, including 14 who were taken to brainwashing centres. The arrested practitioners are located in 27 of China’s 33 provinces, autonomous regions and provincial-level municipalities. 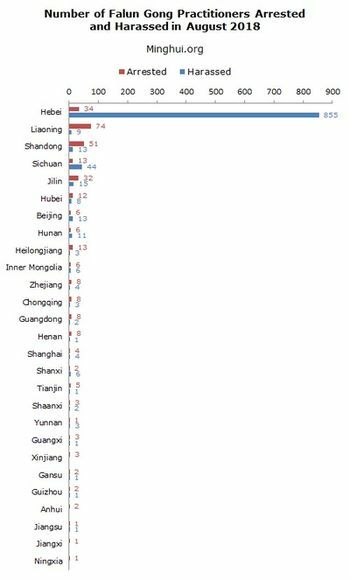 Liaoning Province had the most arrests with 74 cases (24% of the total), followed by Shandong, Hebei, Jilin, and Heilongjiang. In January 2018, the Chinese regime launched a new campaign to combat criminal gangs. But in some regions, including Hebei, Shandong, Sichuan, and Liaoning Provinces, Falun Gong practitioners became the targets. In recent months, practitioners have been subjected to large-scale arrests and harassment. In Liaoning Province, 31 practitioners and their family members were arrested during the course of two days on August 22 and 23. In Zhaoyuan City, Shandong Province, more than 20 practitioners have been arrested since August. It was also reported that in Shulan City, Jilin Province, 12 practitioners and one practitioner’s family member were arrested on July 18, 2018. The police arrested the practitioners while they were asleep. One practitioner was taken away in her underwear. Several others were harassed the same night or the next day. Earlier this year, several mass arrests of hundreds of practitioners also took place in Shandong, Jilin and Heilongjiang. In addition, a large number of harassment cases have also been reported in August across many cities in Hebei Province prior to the secretive Beidaihe meeting, a significant event for the Chinese communist regime. In Laishui County only, it was reported that over 500 practitioners were harassed by police in August. The details and practitioners affected are still being investigated. An officer in Cangzhou City, Hebei Province, revealed to a practitioner that it was the Hebei Police Department that ordered the harassment. Officers were instructed to ask practitioners whether they still practiced Falun Gong and videotaped them as they answered the question. The police threatened the practitioners’ college applications or their family members’ job prospects if they refused to cooperate. Officers were also particular about obtaining the practitioners’ personal information, such as their cellphone numbers and WeChat IDs, the dominant social app in China. Some officers forcibly took pictures of the practitioners, as well as the interiors and exteriors of their homes. It was also reported in August that 91-year-old Mr. Yu Jiachuan and his 88-year-old wife, Ms. Wu Ruiqing, were harassed and had their photos taken by the police from Haiyang Police Station in Qinhuangdao, Hebei, on July 25, 2018. But due to the suppression of information in China, such cases can’t always be reported in a timely manner. In addition to the large-scale arrests, the police extorted a total of 125,550 yuan (about $18,334 USD) from 17 practitioners, or 7,385 yuan per person on average. While Mr. Song Jiaxing and his wife, Ms. Wang Xiuyun, were buying gifts for a friend in the hospital on August 24, police noticed that they paid using paper bills marked with Falun Gong-related messages. Officers arrested the couple and confiscated more than 30,000 yuan in cash from their home. Mr. Song is currently detained at Qi County Detention Centre, while Ms. Wang is kept at Kaifeng Women’s Detention Center in Henan Province. Mr. Wu Mingshu, 66, from Suining City, Sichuan Province, was arrested at his home by officers from Dongchan Town Police Station on August 28. At the police station, an officer held Mr. Wu’s head and knocked it hard against a wall. He lost consciousness immediately. When he was sent to a hospital, doctors refused to admit him upon finding that he had severe bleeding in the brain that was beyond medical treatment. The police then attempted to send him to another hospital. It was unclear whether the other hospital accepted him and his current situation. Ms. Li Qingxia, 75, was followed and arrested by police officers for talking to people about Falun Gong on August 10, 2018. After she was taken to the detention centre, Ms. Li developed high blood pressure, a high fever, and severe pain in her leg that made it difficult to walk. Despite her daughter’s persistent requests, the police refused to release her. The procuratorate approved her case on August 24. She is now facing possible prosecution. Her daughter is very worried about her health. Mr. Li Zhanbin, 57, was the principal of an elementary school in Fangzheng County, Heilongjiang Province. He lost his job due to the persecution of Falun Gong and had to do odd job to support his child’s education. He lived in another city away from his family to avoid being arrested for his faith. While he went back home to visit his family, three officers came to his home and arrested him on August 18, 2018. The police said to his wife that they arrested him because of his practicing Falun Gong and telling people about it. He is now detained at Fangzheng County Detention Centre. Mr. Li’s recent arrest left his wife in despair. She repeatedly called the police to seek his release and the return of their personal belongings that had been confiscated when officers ransacked their home. However, her requests were rejected each time. After the arrests of his two daughters and a grandson in late August, 85-year-old Mr. Lin Tong from Maoming City, Guangdong Province, is often in tears and can’t eat well. He said he felt “so painful, like someone stabbed me a few times.” He is calling on the police to release his loved ones. Ms. Lin Yanmei and her nephew Mr. Wu Zhaoqi were arrested on August 29 while celebrating the birthday of the elderly Mr. Lin. The police broke into their home and confiscated many Falun Gong-related materials, 20,000 yuan in cash, and the elderly father’s pension savings. When the elderly father confronted the police for ransacking their home, they grabbed his arms so forcefully that they tore his skin and made his arms bleed. After the younger sister, Ms. Lin Lizhen, hired a lawyer to represent her sister and son, she was arrested on August 31. All three of them are now detained at Maoming First Detention Centre. Mr. Wang Yongli, from Shenyang City, Liaoning Province, was scheduled to be released from prison on August 22. But before he walked out of prison, officials from Shenbei Police Department drove in and took him into a police van. 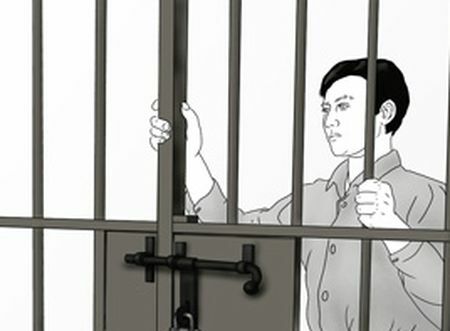 They prohibited him from meeting family members and directly sent him to Shenbei Detention Centre, threatening to imprison him again.